Sunil Rao works as a manager for a multi-national company in Gurgaon. A few months back he bought a house for himself under the 'Subvention Scheme', which was advertised as 80:20. The scheme seemed too good to let go, so he immediately booked a flat in the project. But a few weeks back, Rao got a letter from the developer saying that there might be a delay in the completion of the project. He also received some notices from the bank that approved his loan saying that the interest rate on the loan had marginally increased. Rao is now wondering whether it was wise of him to have invested in such a scheme in the first place. Gayatri Sharma is a software engineer who is looking to buy a property of her own and is really keen on using the 'subvention scheme' to her benefit. She read a newspaper article about how such a scheme requires you to pay an initial amount to the developers, while the rest is paid by the bank. In this case, she has to pay only 20 per cent of the flat's cost. She was also attracted by the fact that she would not have to pay any Equated Monthly instalments (EMIs) till the construction of the house was complete. However, some of those articles also cautioned her against the pitfalls of such schemes. Now, she is not quite sure what to do. Recently, a number of developers have come up with such subvention schemes. According to this arrangement, you can buy an under construction property by initially paying 20-25 per cent of the total cost of the property. The remaining 75-80 per cent is paid by the bank directly to the developer. Till the customer gets possession of the house, it is the builder who pays the EMIs on behalf of the customer. The advantage for the builder is that he gets the entire funds up-front, instead of the bank disbursing funds at every stage of construction as is the case with a normal loan. Once the customer gets possession, his EMIs kick in. For this developers enter into three-way agreements with banks and customers. While this may sound like a win-win for both the developer and the customer, there are several catches that customers must be aware of. If there is a delay in delivery, then the customer stands to lose more. As soon as the subvention period is over, the EMI based on the 80 per cent loan will begin, irrespective of the construction status. In case the house is not ready by then, and if the customer is staying on rent, he will have to pay both the rent as well as EMIs. If the developer delays the EMIs he is supposed to pay on behalf of the buyer, credit information bureaus will not hold the developer responsible, because in the bank's records it is the customer who is the borrower. This means the customer's credit score will suffer. If the property is a disputed one, customers must make sure all documents are in order. Or else getting your funds from the builder could be tough. Given that most of the real estate projects get delayed, one may actually end up paying much more than he/she actually planned for. Even if the builder is penalised for delay in handing over the house, he will try to recover it by offering lesser area under the guise of super built up area or levying other charges. So, there is no benefit for the home buyer. Recently, the Reserve Bank of India (RBI) conveyed its dislike for such 80:20 or 75:25 schemes. The RBI was unhappy about the fact that the banks were making an up-front payment to the builders and putting their money at risk. 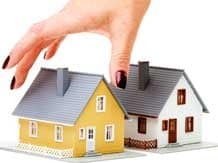 The home loan disbursal should be linked with the stages of construction of a building, so that the money loaned by the bank does not get locked up in case of a dispute between the borrower and the developer, said RBI. While such schemes may look good at first glance, the fact is that if the project is delayed, you will end up paying much more than the original loan amount. In fact, these schemes are floated only because developers were finding it difficult to raise funds. In a lot of cases, developers diverted funds raised for one project towards another. Subvention schemes are a double edged sword. So, watch out before you sign up for it.